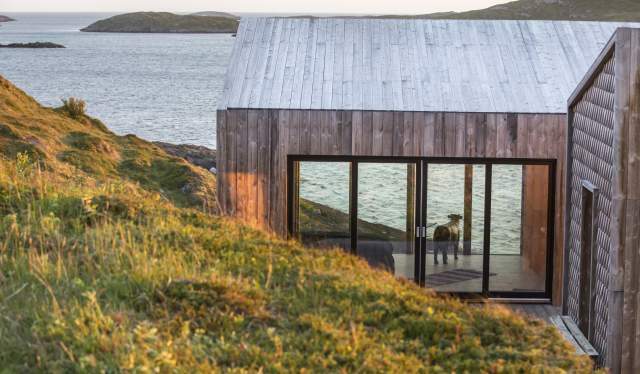 On a windswept, yet beautiful island south of Bodø, some of the world’s most renowned architects have designed boxes meant for contemplation. Now, you can rent them. “Maybe it’s the view, maybe it’s the ocean… But something happens to you, creatively speaking, when you have a horizon”, Håvard Lund (46) says to Visit Norway. Lund is the initiator behind “Fordypningsrommet Fleinvær” (meaning Refugium at Fleinvær), located on the island Sørvær in Nordland county. On the island surrounded by the Vestfjord, you find a tiny community consisting of a dozen houses. But otherwise, it’s the tranquillity and nature that reigns. No cars, no shops. And here – an hour by boat from Bodo – there’s built a bunch of rustic cabins of high-quality architecture. Now, artists and others who look for contemplation and calmness can book the facility. Håvard Lund is a recognized musician who lives in Bodø, but because of his career, he spends most of the year travelling. The project has all been possible thanks to Lund’s serious commitment. “It began with an idea to build cabins, but it grew to something much greater than that. I have spent so much time on Sørvær, and I wanted to share the experience of the island with others”, Lund explains. The nine buildings consist of four tiny sleeping houses, one sauna, a bathhouse, a kitchen, a creative room, and a “thinking box”. “The thinking box is a minor cathedral which frames the nature in such a beautiful manner. It gives you an insanely blissful feeling to be there”, Lund says. The project is designed by the architects Sami Rintala and TYIN tegnestue. 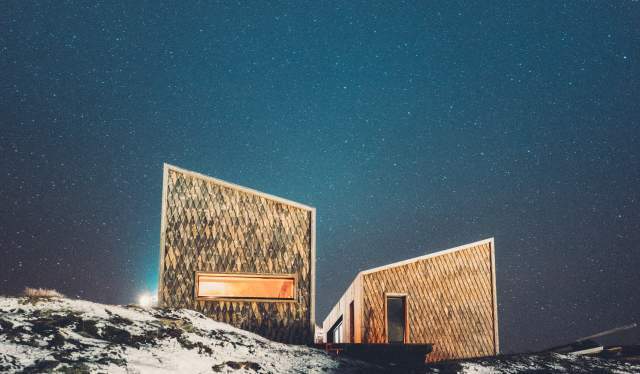 To the Norwegian magazine A-Magasinet, Rintala tells how the idea was to create small buildings that could adapt to the terrain, instead of just one large and dominating building. “All of the houses have been given their own character. You can see them as a family with a mother, father, children and cousins. They have the same materials, but are still different”, Rintala says to A-Magasinet. Until now, the houses have been used by both artists and companies. Yet, Lund assures that he gladly welcomes travellers from around the world. If you want to stay at Refugium Fleinvær, you must book the entire facility, which can accommodate up to 12 people. The price is NOK 30.000 (approximately EUR 3340), for a week. Artists who need access to the refugium can apply for funding at Nordland county. The assumption is that the visiting artists share some of the conducted work with the audience afterwards. Read more about the facility and book the refugium. Experience the cultural hub of Bodø as well as untouched nature, the world’s strongest tidal current, and remarkable, windswept mountains. The scene is set for memorable adventures. Bodø is know as a vital cultural city. Here, the city’s most acclaimed young band shares their local tips on what you should see and do while visiting Bodø.